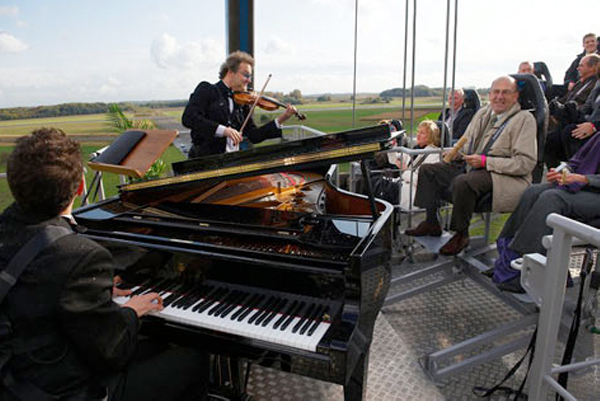 If heights aren't your thing then this probably isn't for you, but several months ago I bookmarked this site called Dinner in the Sky and am now just revisiting it. Have you seen this? Would you be up for having a dinner or event way up high? Since it is available in over 30 countries around the world, there are many possibilities -- where would you want to dine in the sky? What a lifetime experience this would be, doesn't it look so magical! this makes me so queezy in the stomach ( fear of heights..) what a cool venue though!! What happens if you need to pee? That would be amazing and scary all at the same time. Whoua... I'm Belgian, and I only "hear" about this here! Wouldn't dare to try I have to admit. it looks awesome but i don't think i'd be able to do it. i convince myself i'm going to die every time i go on one of those sky ride things at amusement parks. freak me out. I'm with Poppy Q, what happens if you need a pee? AMAZING! I would love to do this. 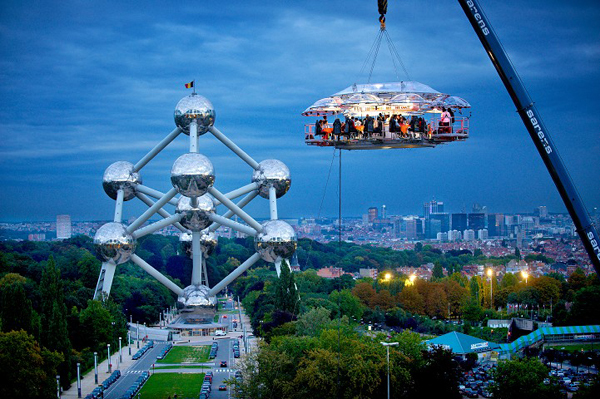 Dinner while floating in the sky....sign me up! Crippling fear usually doesn't excite my appetite! But, then what about those seafood restaurants with aquariums in the walls? Does seeing your food swim free make you more eager to eat it? I'd be simultaneously scared and excited to dine there. wow this is amazing! haha. I am with Poppy - rest room??? lol I am not a heights person so I would never enjoy the dinner but I can enjoy the pictures! This is something I could never do! Just looking at the pictures scares the crap out of me! I feel panicky just looking at the photos... what happens if you lean back in your chair to far? I want to say "yes, I would do this" but I can't.... I am a scardy pants. hmm. i'd want to try this, even though i think i might not enjoy it too much. but hey! it's a new experience. :-) thanks for sharing this! Certainly something you definitely have to try if given the opportunity. I would love to try this, of course not during tornado or hurricane season. Just saying. Thanks for sharing! This is totally unique.